These 6 fine point magnetic markers from The Board Dudes contain magnets in the marker caps to ensure they will hold to any metallic surface. 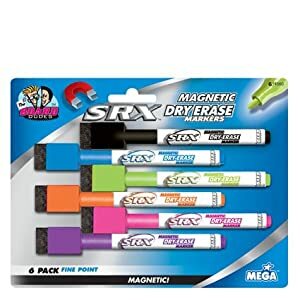 Never lose a dry erase marker again! Includes eraser tips for quick corrections without the mess. Hurry and receive 27% off Magnetic Markers Fun 6-Pack.